The current President of Liberia was born in 1938 in Monrovia, as Ellen Johnson; she grew up in a middle class household, attended the College of West Africa from 1948 to 1955, before settling down and marrying James Sirleaf. The marriage only lasted until the early 60s, but resulted in the birth of four sons. After the divorce Ellen travelled to the United States, to study for an associate degree in accounting, at Madison Business College in Wisconsin; after a few years at her country’s Treasury Department (Ministry of Finance), she went back to the United States, to continue her studies in economics and public policy at Harvard University’s John F. Kennedy School of Government, earning a Master of Public Administration degree. Back in Liberia, she was appointed assistant Finance Minister in President Tolbert’s administration and subsequently became Minister of Finance until 1980, when Master Sergeant Samuel Doe, member of the Krahn ethnic group, seized power in a coup. Sirleaf moved to Washington, D.C., to work for the World Bank, and then returned to Africa as Regional Vice President of Citibank. In 1982 she was appointed Director of the UN Development Programme’s Bureau for Africa. During her time with the UN, Sirleaf became one of seven internationally eminent personalities, designated by the Organisation of African Unity to investigate the Rwandan Genocide; she was also one of two international experts selected by UNIFEM to investigate and report on the effect of conflict on women and women’s roles in peace building. In 2005 Sirleaf took over as leader of the Unity Party. Promising economic development and an end to corruption and civil war, she was elected President. Sirleaf, or the “Iron Lady,” became the world’s first elected black female president and Africa’s first elected female head of state. During her first term as President, she was credited with bringing stability back to Liberia, and in 2011 was honoured with the Nobel Peace Prize, which she shared with Liberian activist Leymah Gbowee and Yemeni journalist, politician and human rights activist Tawakkul Karman; the three women were commended “for their non-violent struggle for the safety of women and for women’s rights to full participation in peace-building work”. 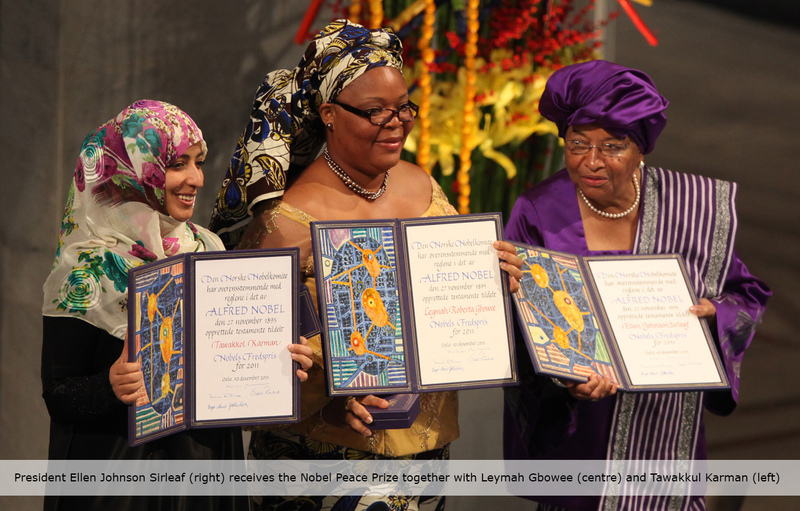 A few days after the Nobel Prize was announced, Sirleaf won the general election and secured her second term in office. In 2007 President Sirleaf made education free and compulsory for all elementary school children in Liberia. In 2010 she signed the legislation on freedom of information in Africa. In recognition of this, she became the first serving head of state to receive from the African Editors’ Union the prestigious ‘Friend of the Media in Africa’ award. During her presidency, Ellen Johnson Sirleaf has managed to significantly decrease her country’s external debt. She has appointed several women in her cabinet. An active member of the Council of Women World Leaders, she worked hard to promote women’s rights and to improve the human rights situation, including vetoing bills that would toughen laws against the LGBT community. President Sirleaf took steps to fight corruption in her country and even within her own administration, not hesitating to suspend one of her sons, from his post as Central Bank Deputy Governor, when he failed to publicly declare his assets. With her second and final term in office coming to an end in 2018, President Sirleaf has managed to avoid serious criticism, possibly because she has worked hard to establish stability and relative prosperity in Liberia. President Ellen Johnson Sirleaf’s success life story proves that more opportunities are opening up for strong and dedicated women in Africa, who receive a sound education and are prepared to work hard to achieve their aspirations and goals. UNICAF supports every one of these women, offering scholarships for academic courses that lead to internationally recognised qualifications; every African woman can realise her potential and make a difference in her country, with the help of UNICAF.